We've taken our Classic Comforter and upgraded it with an increased amount of fluffy down and a higher thread count cover. Enjoy year round comfort and versatility with this traditional, mid-range design. Love the feel, warmth and snuggle factor! My kids love it so much that I have to buy more for their beds to get them out of mine! A small monetary sacrifice and I know my family is warm and happy:) Highly recommend! It won’t be hard to cozy up to this luxe, yet affordable mid-range comforter. We use a 550 fill power Hyperclean® Pacific Coast® down and a durable, 300 thread count 100% cotton cover. A sewn through diamond box construction and Comfort Lock® border creates an appealing look while keeping the down evenly distributed for all-over, shift-free warmth. Navy blue cording outlines the perimeter and convenient loops have been added to help keep your comforter in place inside its cover. 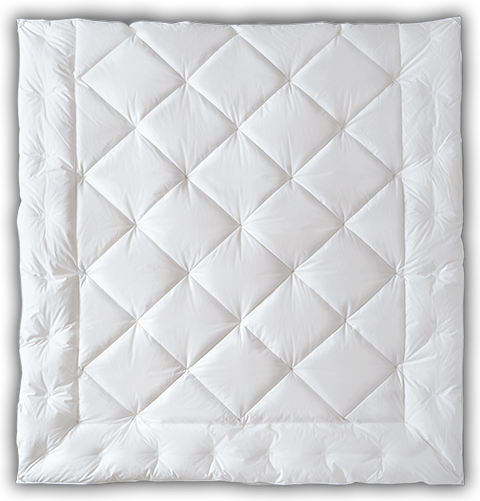 Choose the affordable luxury of our Premier Year Round Comforter if you enjoy sleeping at an average room temperature and are looking for a versatile, all-season comforter. In our attractive sewn through diamond design, the top and bottom layers of fabric are sewn or quilted together in a diamond pattern. This design feature keeps the down in place and prevents it from shifting from one box to another so you can enjoy all over warmth and comfort.